I’ve stripped my 72 Mach 1 and found holes in the wheel tub. Could anyone help me identify if anything is supposed to go here please. That's where the framework for a fixed rear seat is welded in. Looks like someone started to convert yours to a fold down seat, but never finished the job. You're missing the rear framework for the trunk hatch, unless you removed it to do a trunk floor. Funny. The car was a fold down when I got it. I guess it must of been converted at some point? Would it include fold down option on th me marti report? If your car had a production installed fold down seat it would be listed under "Your vehicle was equipped with the following features:" as a Sport Deck Rear Seat. It also included a space saver spare tire. At $86.32 that was a well priced option considering what you received. It did not come with the fold down option. It appears you are missing the rear bulk head completely be it a folddown or not. The picture does not show the complete rear compartment area, but you need something installed to restore some bracing to the back of the car. Here is a picture of the rear bulk head for a foldown. Oh, and by the way my car was built about a week before yours 12/27/71 with a release date of 01/05/72. (08-03-2018, 09:02 AM)bkdunha Wrote: It did not come with the fold down option. It appears you are missing the rear bulk head completely be it a folddown or not. 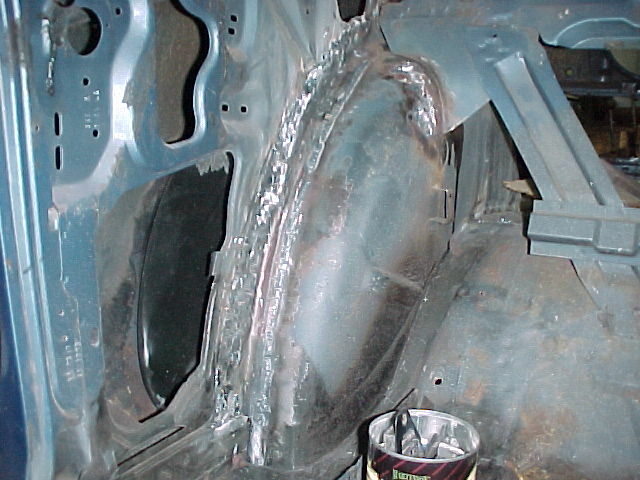 The picture does not show the complete rear compartment area, but you need something installed to restore some bracing to the back of the car. Here is a picture of the rear bulk head for a foldown. Oh, and by the way my car was built about a week before yours 12/27/71 with a release date of 01/05/72. Looks like you were lucky not big speaker holes on each side to have to fix. Most have jagged cut outs to clear the speakers. If you need the partition or fold down Scotty Stickland has them. If you get the fold down be sure to get the spare tire mount for the space saver also it is different than the regular.